I recently purchased the M&P, M2.0 Full Size with a 4.25″ barrel chambered in 9mm (also available in .40 S&W). Now, having spent some time on the range with it, here are my thoughts. Grip Texture. 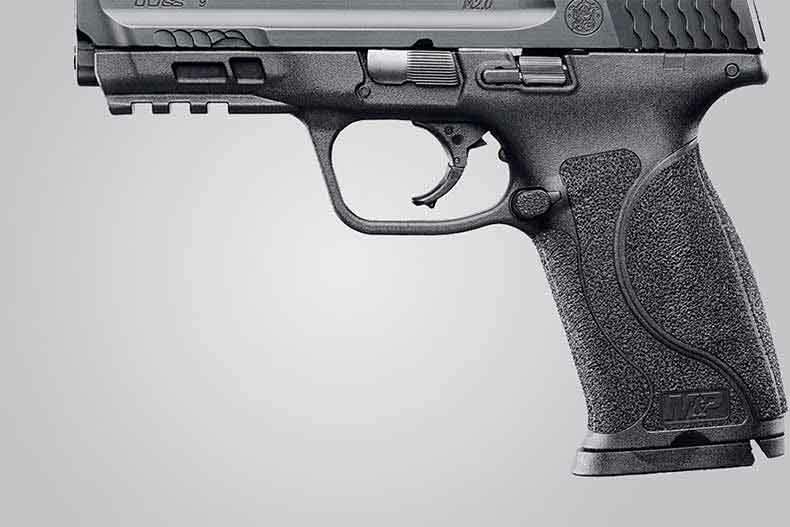 It’s now widely known that Smith & Wesson has changed the stippling on the 2.0’s grip to one that according to Smith & Wesson’s product description offers an “Aggressive grip texture for enhanced control”, similar to skateboard tape. After shooting a few hundred rounds through the 2.0, I have to say that I am not a fan of the new stippling, because admittedly, I have softer hands which makes firmly grasping the 2.0’s grip for extended periods, uncomfortable. To address this, I just inserted a 1.0 backstrap to replace the 2.0 backstrap making my 2.0’s grip much more comfortable now. I am also using the front section of the rubber talon grip on my M&P 2.0’s grip. Trigger. I have a few M&P 9 Compacts (1.0 versions circa 2014-2015) and had an older M&P Full Size (1.0 version circa 2013), so I am quite familiar with those previous generation triggers and have never felt the need to replace them with an after market trigger such as those offered by Apex. Reset is audible and tactile, similar to my older M&Ps mentioned earlier. However, what I really like about the new 2.0 is that the trigger pull is a little bit lighter than the older 1.0 models. Barrel. The 2.0 now sports a 1:10” twist barrel for the 9mm and is supposed to be more accurate. Again, I’m not sure that I can tell the difference, but appreciate any improvements Smith & Wesson has to offer. Finish. The 2.0 has Smith & Wesson’s new Armornite® durable corrosion resistant finish. I thought the finish used on the older M&P’s was fine, but again any improvements Smith & Wesson has to offer is appreciated. Backstraps. The 2.0 now offers 4 Interchangeable backstraps (palmswell grips) as opposed to 3 from previous versions. Since I use the size “small”, the additional size doesn’t make any difference to me, but adding medium-large to the 2.0 may be useful for others. Frame. Gone is the extended beaver tail from previous versions which I never cared for anyway. Additionally, an extended stainless-steel chassis has been incorporated to provide more torsional rigidity to the 2.0’s frame. There are also “cut outs” or “windows” near the front end of the frame where you can see the extended steel chassis. Slide Lock. 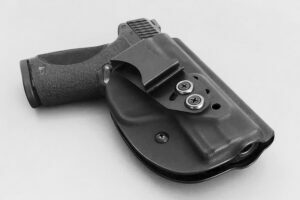 The slide lock has been redesigned to prevent the slide from releasing and moving forward when a full magazine is forcefully inserted. Manual Thumb Safety. As on earlier M&Ps, you have the option of getting one with a manual thumb safety if so desired. Sights. 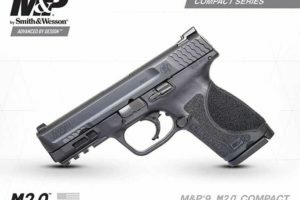 As on earlier M&Ps, the new M&P M2.0 Full Size 4.25″ comes with steel white dot sights. Other Changes. There are other minor and/or cosmetic changes that I don’t think affect me much, such as the slide profile being slimmer along the top as well as some grasping grooves being added along the front bottom edge of the slide. The mag button is now made of stainless steel, rather than plastic. Comfort. The 2.0 uses the same optimum 18-degree grip angle as before, making the point of aim comfortable and natural. However, as mentioned earlier, the abrasive grip texture/stippling is uncomfortable for me, so I put on the front section of the rubber Talon Grips as well as inserted a 1.0 backstrap to replace the 2.0 backstrap to address this issue. Reliability. As with previous versions, the new 2.0 seems to be extremely reliable. 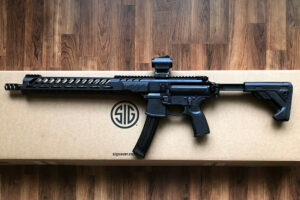 After shooting my 2.0 straight out of the “box” (I did not field strip, clean and lubricate it) with a few hundred rounds of Magtech, 115 grain FMJ and Hornady Critical Defense, 115 grain Flex Tip JHP ammo, I experienced no malfunctions of any kind so far. Recoil. As you might expect in this full size 9mm pistol, recoil is moderate. Capacity. The new 2.0 full size comes standard with the same two 17 round magazines as the older 1.0 version. Price. MSRP is $599, but you should be able to do much better than that. With the introduction of the Glock 19X on Jan 2, 2018, it turns out that Glock has now made a pistol that is almost identical in size and capacity to Smith & Wesson’s Full Size M&P. Let’s compare the specs of both. Length: M&P M2.0 Full Size is 7.40” vs 7.44” for Glock 19X. Height: M&P M2.0 Full Size is 5.50” vs 5.47” for Glock 19X. Barrel: M&P M2.0 Full Size is 4.25” vs 4.02” for Glock 19X. 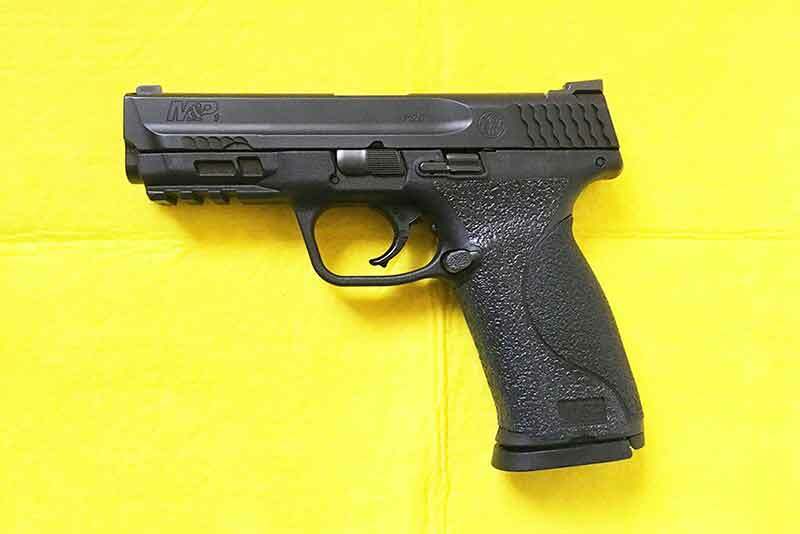 Capacity: The M&P M2.0 Full Size and the Glock 19X both have a standard magazine capacity in 9mm of 17 rounds. However, the Glock 19X also includes two 19 round magazines. Weight: M&P M2.0 Full Size is 24.7 oz vs 24.83 oz for Glock 19X. 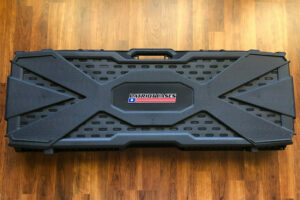 MSRP: M&P M2.0 Full Size is $599 vs $749 for Glock 19X. The M&P includes two 17 round magazines, while Glock includes one 17 round magazine, two 19 round magazines and night sights. Overall, I really like my new Smith & Wesson M&P 9 M2.0 Full Size and plan to use it as our new home defense firearm of choice. 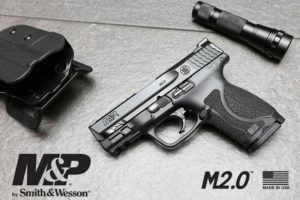 For more information about the M&P 9 M2.0, visit the Smith & Wesson website. Here’s my new M2.0 with a 1.0 backstrap and the rubber Talon Grip on the front of the grip making it much more comfortable to shoot. By the way, here’s a link to Talon Grips. which really makes the best rubber (and textured) grips for a variety of firearm makes and models.